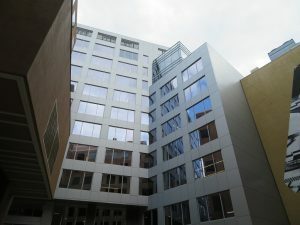 600 Mass Ave incorporates natural elements that enhance the work environment. A sunlit atrium, a striking water feature, a fresh Rooftop Garden, inviting terraces, and world-class landscaping are all part of this premium experience that blends natural elements with a modern workplace. 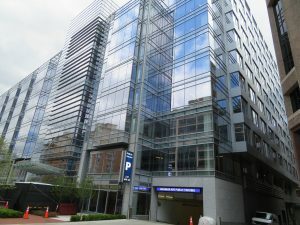 Located amid the finest that Washington, DC has to offer, 600 Mass Ave is ideally situated within close proximity to restaurants, retail, entertainment venues, hotels, museums, and public transportation. Innovative and conscientious, 600 Mass Ave offers efficient space planning and is designed to achieve LEED® Platinum certification – the highest level of achievement in sustainability. Exterior Envelope – fabrication and installation: John W. McDougall Co.
We used our Series 400 rainscreen panel system for this project, which is a rear ventilated rainscreen system that also provides a ½” wide x 1″ deep reveal between adjacent panels. This system is the proven solution to exterior and interior panel needs when visible caulk joints are not desired. Pockets within the continuous perimeter extrusions receive reveal strips that fill the ½” gap between the panels. This reveal strip can be supplied in matching or contrasting colors giving the Series 400 systems a clearly defined joint line between the panels. The product was 4mm FR core Reynobond in bright silver metallic.